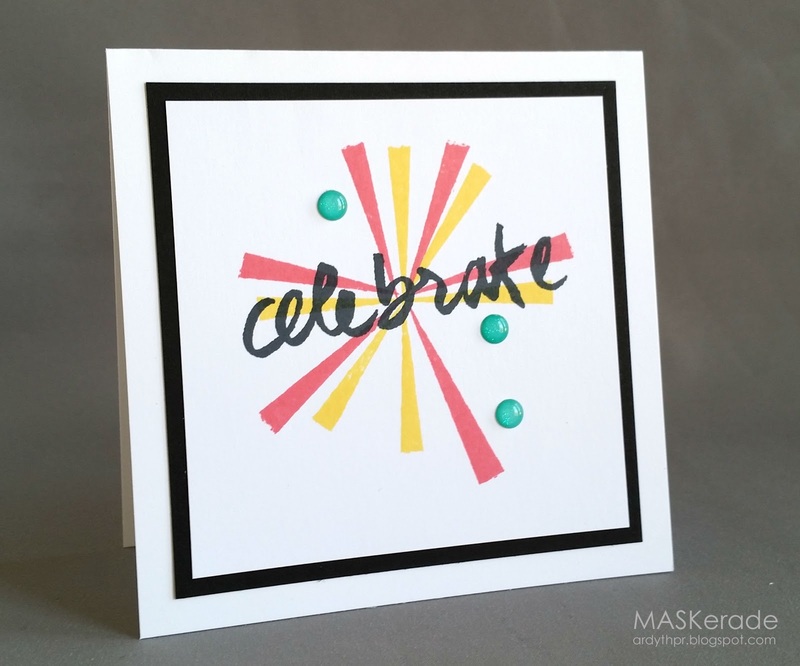 I used Avery Elle Bright Days to create the starburst by using a circle mask and stamping the yellow 'arms' and then using a slightly larger circle mask that was offset a bit to stamp the red. I love that the edges of the red and yellow arms are rough - they work perfectly with the 'handwritten' Papertrey Sentiment (am I the only one who thinks that says celebrake? I can see it's a t, but the way it's joined up to the a leaves some doubt! lol!). I finished it off with 3 sparkly enamel dots. I hope you'll get a chance to play along! The deadline is Monday at 8 am. At that time, you can vote for your top 3 favourites (did you know that you can vote for one, two or three of your favourites - you don't have to choose 3 if you don't want to) until Tuesday at 8 am. Voting results will be posted on Tuesday at noon. Wow! Fabulous how you were inspired! 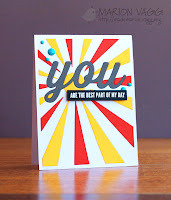 I love how you made you 'sunburst'. Ardyth, WOW! I love this card, it definitely makes you want to celebrate!!! So much energy in this card. This is such a perfectly Ardyth take on the Marion's card! And you're right - it totally looks like Celebrake!